The city of Thiruvananthapuram sited along the pictorial shoreline of the Arabian Sea is home to a wide number of attractions that are popular among the regional sightseers and international tourists as well. Ranging from historic monuments to modern wonders and from exotic beaches to tropical greeneries, Thiruvananthapuram is home to various interesting destinations that are ideal for weekend trips or single-day tours. In fact, talking about these picnic spots in Thiruvananthapuram, the options found for the holidaymakers are innumerable. Wildlife reserves, back waters, lagoons, tea estates, spice gardens and coffee plantations – so much is there to explore apart from the countless viewing points that are located across all the major tourist attractions in and around the city. Activities at these popular destinations primarily include picnicking, hiking, nature viewing and wildlife visits. Especially for the tourists in Thiruvananthapuram short one-day tours at these picnic spots are worth enjoying. Agasthyakoodam, an enormous mountain peak, elevated to a height of about 1868 metres from the sea-level is one such picnic point in Thiruvananthapuram featuring fascinating views and thrilling options for activity and fun. Agasthyakoodam, which is also popular as Agasthyamalai or Agasthya Mala, is one of the most stunning sites reachable with a short drive from Thiruvananthapuram. KSRTC buses also take the picnickers to Agasthyakoodam. Serving as one of the best picnic spots within around 50 kilometres from the city, the beautiful sight of this place elates all senses related to our body and mind. 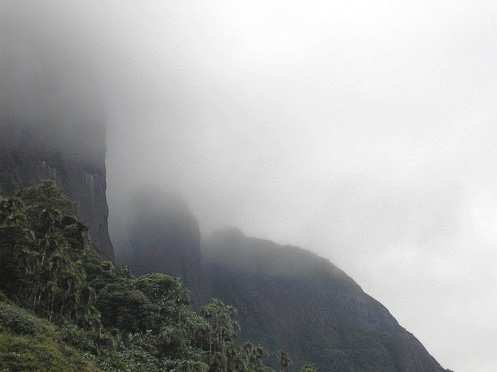 The area is known widely for the compelling views of this Agasthyakoodam, one of the major peaks adorning the long chain of mountains that comprise the Western Ghats. The picturesque setting here changes every now and then – sometimes the gigantic peak is seen clad with white snowy clouds and at times it is seen soaring up magnificently embellishing the blue azure sky. Great as a hiking point, the scenic picnic spot also holds religious significance a local story of this place being closely associated with Agasthya, a Hindu sage. As he was not a married man, the admittance of women in the area is prohibited even today. The native people at this place avoid the association of women due to its religious significance. Hiking is allowed here in the form of a forest pass and a hiking tour here also brings the hikers closer to the rare sight of blooming Neelakurinji. This flower happens to be one of the leading attractions for the picnickers in the region reproducing flowers once in every twelve years. Included within the boundaries of the Neyyar Wildlife Sanctuary, which is embraced by the Agasthya Mala Biosphere Reserve, this colossal mountain is positioned as a part of three important districts in the area – the districts of Tirunelveli and Kanyakumari in Tamil Nadu and district Thiruvananthapuram. The eastern part of the mountain holds the source of the Thamirabarani River, which reaches the Tirunelveli district from there. The Karamana River, source of fresh drinking water in the region and the Neyyar River also commence their flow from this mountain. Picnicking amidst the thriving greeneries at the foothills of the range and hiking up the natural trails enjoying the rich variety of flora and fauna are some of the most favourite activities for the picnickers in the region. The infrequent presence of more than 2000 herbs with specific healing properties that are intrinsic to the ayurvedic therapies in the region, adorn the area in and around. 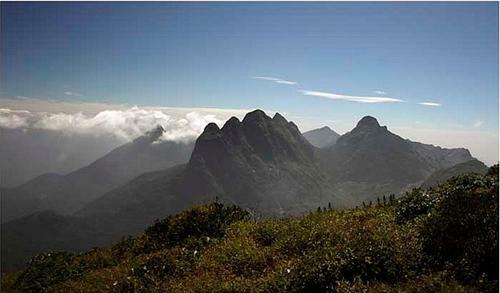 The trekking bases of this mountain peak are home to a number of tea estates mainly in Ponmudi, Boncaud and Brimore. January to the middle of March is the best time for the picnickers to visit Agasthyakoodam, especially for those genuinely interested to trek up to the mountain top as trekking is the only possible means to reach atop. Trekking passes for the entire year are issued at the district office of Kerala Forest Department located in Thiruvananthapuram. Bonacaud is the starting point for this trekking tour in Agasthyakoodam, the length of the trek being about a total of 55 kilometres. The trekking route, up to the mountain and down, is covered in a time of two days, the base camp being located 20 kilometres away from the Bonacaud forest checkpoint. An affordable option for night stay along with the facilities of food and washroom is available here. The trek to the peak is about 10 kilometres. The route originating from the Neyyar Dam is currently closed for the occasional trekkers. The Manjolai Hills, Kalakkad Mundanthurai Tiger Reserve, Manimuthar Dam, Kodaiyar Dam, Manumuthar Waterfalls and the view point called Kuthiravetti are the other attractions sited in and around the range of Agasthyakoodam.